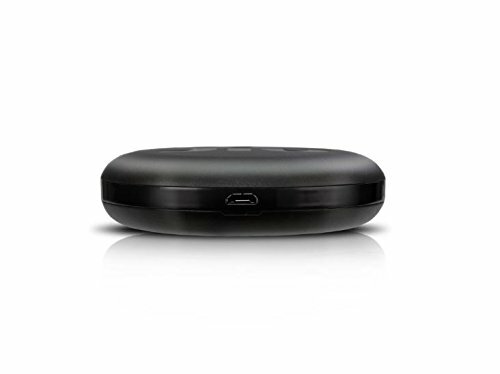 Buy Online JioFi 4G Hotspot JMR815 150 Mbps Jio 4G Portable WiFi Data Device. Buy The new JioFi is here to ensure you enjoy high speed internet powered by the Jio 4G Network. 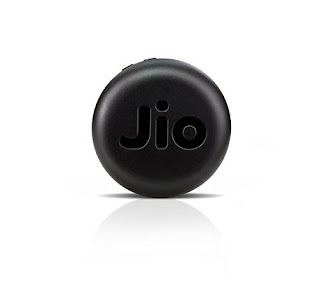 So go ahead and connect your smartphone to the JioFi device and groove to your favorite music, or stream a movie on the go. 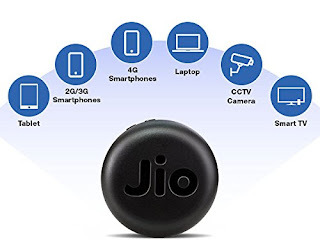 There is never a dull moment with the JioFi JMR815 wireless data card, all thanks to its blazing fast connectivity over a wide range of devices. Enjoy 4G features on your all your Wi-Fi capable devices. True 4G speed - download speed up to 150 Mbps and upload speed up to 50 Mbps. Recommended to connect up to 10 Wi-Fi enabled devices (smartphone, laptops, tablets and even smart TVs). Best in class battery (3000mAh) supports up to 8 hours of surf time, expandable memory capacity - 64 GB. 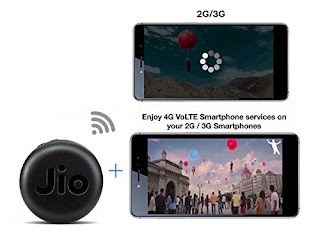 Make video and HD voice calls, audio and video conference, send SMS with Jio4G Voice app. Price: 949 Rs. 2499 Rs. Enjoy the blazing fast internet speeds on the Jio 4G network. Supports up to 150 mbps download and 50 mbps upload speeds so you can upload and share photos and videos on Facebook, Instagram and YouTube without the long wait. Connect all your smart devices to the new JioFi, and enjoy the true 4G speeds on the go. A new battery (3000 mAh) which lasts through the day. Make video and HD voice calls, send SMS and set up (5+1) audio or (3+1) video conference calls with the Jio 4G voice app. Connect all your smart devices with ease, with your JioFi and enjoy 4G internet speeds. JioFi lets you connect up to ten Wi-Fi-enabled devices at a time, to help your friends and family connect on the go, at home or outside.